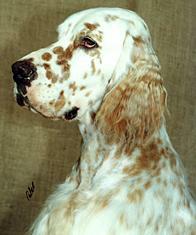 English Setters are gun dogs. The breed was known in England in Elizabethan times, although the modern English Setter was developed only during the last century. Used by hunters to locate upland game such as quail and partridge, the breed is enthusiastic when at work, having a keen game sense. In the field it ranges out from the hunter and on locating game, drops before it in a crouch. This instinct is still strong in lines bred both for the show ring and as companions. English Setters look forward to and enjoy their exercise, however once the daily walk is over they are quite content to curl up at their owner's feet, or better still, on their owner's bed! English Setters normally live to 10 years of age, but in the right environment and given the right nutrition will live up to 12 years of age. English Setters are intensely friendly by nature. Well mannered with other dogs, and loyal and affectionate by disposition, this breed is ideal as a companion for adults and children. English Setters are truly reliable in temperament, so thoroughly deserve the honour of being called 'the gentlemen and gentlewomen of the dog world'. A well-known television program places them in its Top Ten of recommended breeds. This is a dog that thrives on human contact, so English Setters will not take happily to being left to their own resources for long periods of time. Being such good-natured dogs, English Setters will live happily with most pets. They are social animals and are best kept with another dog. 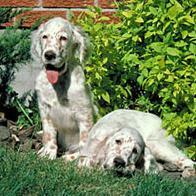 English Setters are active dogs that benefit from regular exercise. If they do not receive a daily walk and/or run in the park, they will tell you about it by either barking for attention or digging holes in the garden. Such behaviour is not specific to this breed, but is typical of any dog that becomes frustrated through lack of attention. Although a long coated breed, English Setters possess a silky textured coat that is easy to maintain. Brushing or combing for ten minutes twice a week is sufficient to groom the coat. However it is always a good idea to check for grass seeds or burrs immediately after a romp in the open. This way you will prevent coat tangles, and foreign bodies from entering the skin, eyes and ears. Show dogs are kept in show trim, with breeders always being prepared to help new owners master the technique. It is not necessary to keep a pet English Setter this way, but making sure the coat is clean, free of tangles, plus trimming away knots beneath the ears and excess hair from between the toes, will all make for a happy and healthy dog. Between baths, a sprinkle of talcum powder brushed through the coat will help keep your dog smelling sweet. English Setters are usually good eaters, and if you are not careful, will lure you with their gentle, brown eyes into feeding them far too much. English Setters were bred to find game so they love running, and when they fix on a scent or give chase to a bird, they can become heedless to possible dangers such as the motor car and busy roads. So you must ensure your English Setter is only allowed to run free in a perfectly safe area. If you have a young family and want them to grow up with a reliable, even-tempered dog, and if you enjoy regular exercise and quality time with a loyal, good natured companion, then the English Setter is for you.